Anyone reading news about Australia lately might be forgiven for thinking the country is overrun with snakes, that we are fighting them off on our way onto trains and planes, in hospitals and in our homes. The stereotypical view of Australia as a dangerous place full of things that sting, bite and maim has been given an added twist recently with some truly bizarre snake-encounters that have made the news. There was the story about an inquisitive three-year-old boy from North Queensland who found a nest of nine eggs in his backyard, put them in a plastic takeaway container in his cupboard, only for them to hatch as deadly brown snakes – poisonous from birth. There’s this tale about a Tiger snake found in a hospital bed in Melbourne and most recently, this rather sad story about a scrub python – the largest snake in Australia – which was filmed at thousands of feet above sea-level in a life and death struggle on the wing of a Qantas aeroplane flying from Cairns to Port Moresby. All these incidents have given me cause to reflect on my own encounters with snakes in Australia, of which I have had a few. First, I should begin by saying that unless you live in the country or tropical Queensland (which is rather snake-infested), the chances of encountering a snake in the city or even the suburbs is pretty rare. That being said, I first crossed paths with what I believed to be a very large python one rainy night. I was walking home from Fortitude Valley, the entertainment quarter of Brisbane down Brunswick Road, a steeply dipping road lined with shops, houses and apartments and it was pouring with rain. Now on occasion, after one or two beers too many, I had mistakenly identified, late at night, fallen branches as would-be serpents, only to discover that they were nothing more dangerous than something to trip over. However, on this night in question, as I walked through a section of shops and cafes – all closed and quiet, an enormous snake slithered a few metres in front of me, across the pavement and under a house converted into a shop – most houses in Brisbane are raised above the ground (they’re called Queenslanders) so they make a nice spot for a snake to find warmth and shelter. Well I got quite a shock upon realising it really was a very big, very real, very live snake and that if I’d been a bit more drunk and a just a little bit more careless I could well have stood on it! The two other encounters with snakes that are worth mentioning both occurred on a farm we were living on in the outskirts of Sydney near Hornsby on the North Shore. It was a big old house with acres of land where my sister-in-law had horses and there were rabbits and colourful birds. We spent most of our time in an enormous front room with floor to ceiling windows that looked out over the fields and the horses – it was quite an idyllic place really. One morning, as we got up to go out for breakfast – it must have been the weekend – I closed the front door of our front room and noticed something green and glistening just underneath the roof. Looking down at us, its head resting just over a wooden ledge, we all got the shock of our lives. I remember we called the wildlife number, who told us to ignore it after I described the appearance of the snake on the phone and then I rushed out and bought a book of Australian snakes to identify the specifies. 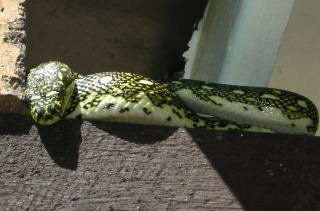 It turned out to be a diamond-backed python, and it became a regular visitor on the farm. I would often see it winding its way through the vine leaves in front of the double doors of the front room. On one occasion, the snake did so while we had a guest staying over who swore she would drive all the way back to Sydney (about an hour away) if she saw the dreaded snake. Her back was facing the window and she had absolutely no idea the snake was only a metre or so behind her – though behind the doors. I actually grew to really like the snake, it had beautiful markings and never ever bothered us, content with its position up in the roof (though later I learned, after we moved out, that it crawled into the house and over the sofa one night). My last snake tale is a bit sad. I had parked my car on the grass to clean it and then later driven to the supermarket to pick up groceries. I was driving a Toyota at the time, and not once in many years of owning had it not started. Groceries in the boot of the car, the dogs in the backseat, I stuck the key in the ignition and turned it over. The car spluttered but refused to start. I tried again. Something was not right. I flung open the car, the dog ran off, and I saw a badly burned and mangled snake emerging from the bonnet. It was pretty horrible. I got into a bit of a panic. As the snake writhed in agony, people shouted at me to drive over it. I grabbed the dog, threw him into the back of the car and drove off at high speed, wondering what sort of parallel universe I had just entered and hopefully left behind. It was a weird f@cking day! 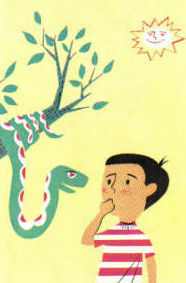 So those are my three major snake tales, though not my only encounters with these curious creatures. I’ve encountered a python on a nature walk, a little green snake on the beach and recently saw an enormous snake on the side of the road as we drove from Sydney north to Taree over Christmas. Funnily enough, while my friends in the UK warned me about getting bitten by snakes and spiders “on the arse” when I moved to Australia, the only thing that ever attacked me was a bird. A ferocious magpie dive-bombed me once when I was living in Coogee, near the beach. No one had thought to warn me about a little black and white bird that turns feral around Spring time.